Welcome to the April 2019 edition of the PM World Journal (PMWJ). This is the 80th edition of the PMWJ; unfortunately, we broke the string of consecutive monthly editions with the cancellation of the March edition following our fatal website crash on 1 March. We have taken this opportunity to also make a few changes in both the journal and the production process, as explained below. So welcome to the new PMWJ. For those of you who have been readers and contributors over the years, you will not notice many changes. For those who are new to the PMWJ, I want to clarify that our mission is to promote knowledge sharing and continuous learning related to program and project management (P/PM). We publish a wide range of articles, papers and reports each month from authors around the world. We take pride in the global nature of our content, as reflected again this month with 45 works by 36 different authors representing 19 different countries. Our readers are also located in dozens of countries worldwide, even though the PMWJ is primarily an English language journal. We think the PMWJ may be the most diverse publication serving the PM world. Now what in the heck happened in March? 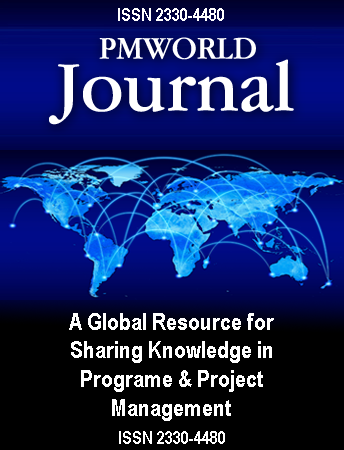 As most of you may know, we produce, operate and maintain two information-based websites: the PMWJ at www.pmworldjournal.net and the PM World Library (PMWL) at www.pmworldlibrary.net. The PMWJ is an online digital publication containing 35-45 new articles and papers each month related to P/PM; it has been published since August 2012. All works published in the PMWJ are then archived in the PMWL, which has grown to now contain more than 2900 works by 1300+ authors. The PMWL has also been expanded to contain access to a great deal of additional educational information. We use WordPress as the digital platform for creating and managing both websites. Up until March 2017, our websites were hosted on a dedicated server provided by a major US internet service provider. With the help of an offshore consultant, in early 2017 we migrated to “the cloud” in order to save money (a very significant savings, actually!). Our new configuration included databases hosted by an infrastructure-as-a-service (IAAS) provider, with dual servers in Europe and the USA. We also enabled a digital networking service (DNS) company to provide front-end caching, distribution and security functionality. Responsiveness of both websites increased while costs went down. It worked fine for two years. On Friday, 25 February, while attempting to upgrade WordPress to the latest version for the PMWL, the server connection was lost; visitors all saw a 501 Error Message. The site was down. The problem seemed to reside with our (cloud-based) IAAS server hosting company. Our tech support advisor began to research the problem, started a “ticket” with the server provider’s tech support team, asked questions and tried to follow their advice. Guidance seemed to require a rebooting of the servers that were hosting our two databases. At 10:07 p.m. central U.S. time on Friday, March 1st, the server reboot button was pushed. Until that time, the PMWJ website had not been affected. When the server reboot occurred, the PMWJ site went down as well. I was unaware of this fact until the next morning. Meanwhile, our tech support advisor was trying to bring the PMWL site back up. By the end of the weekend, it became clear that as a result of the server reboot, both website databases had been completely wiped out. Since its creation in 2012, the PMWL website has been backed up on a daily basis using VaultPress, a security plugin for WordPress websites. While the restore capability seemed to exist, we were still unclear about what had happened and whether the cloud-based server host was functioning properly. Why had the site crashed in the first place? For the PMWJ however, we had apparently not implemented VaultPress. I think I had long been under the impression that the one VaultPress account covered both websites. I was wrong. The journal website was not backed up properly. It also turned out that the IAAS provider also does not backup their servers for clients (which I found incredible and very hard to believe). While our tech support consultant worked to restore the PMWL site with help from VaultPress, I began to communicate with the IAAS company that had the cloud-based servers that had been hosting our databases. I opened a “ticket” and began questioning the loss of our database; daily answers led nowhere. They denied having any responsibility for the loss, denied having the ability to recover any of our data, and basically shrugged off our disaster. They provide no telephone support, nor even provide a telephone number for the company (which is apparently based in New York). It became very very frustrating. David L. Pells is Managing Editor and publisher of the PM World Journal (www.pmworldjournal.com) and Managing Director of the PM World Library (www.pmworldlibrary.net). David is an internationally recognized leader in the field of professional project management with more than 35 years of experience on a variety of programs and projects, including engineering, construction, energy, defense, transit, technology and nuclear security, and project sizes ranging from thousands to billions of dollars. He occasionally acts as project management advisor for U.S. national laboratories and international programs, and currently serves as an independent advisor for a major U.S. national nuclear security program. David Pells has been an active professional leader in the United States since the 1980s, serving on the board of directors of the Project Management Institute (PMI®) twice. He was founder and chair of the Global Project Management Forum (1995-2000), an annual meeting of leaders of PM associations from around the world. David was awarded PMI’s Person of the Year award in 1998 and Fellow Award, PMI’s highest honor, in 1999. He is also an Honorary Fellow of the Association for Project Management (APM) in the UK; Project Management Associates (PMA – India); and Russian Project Management Association. Since 2010 he is an honorary member of the Project Management Association of Nepal. Former managing editor of PM World Today, he is the creator, editor and publisher of the PM World Journal (since 2012). David has a BA in Business Administration from the University of Washington and an MBA from Idaho State University in the USA. He has published widely and spoken at conferences and events worldwide. David lives near Dallas, Texas and can be contacted at publish@pmworldjournal.net.